Thanks again for participating in the first (annual?) COMMENT COMMIT! I really, really appreciated the camaraderie that developed over the last two weeks and the help with sticking to my workout plan. Comment commit really helped me with weeks four and five of MISSION: Balance. When I first created this plan back in November it felt a little intimidating, like it was going to be hard to fit it all in. After five weeks I think it truly is an excellently balanced program for me, the only tough part was that I wasn’t up to running for the last week because of being sick. I accomplished my workout goals for the day! And had a blast doing them! Around noon Kath came over for some yoga and catch-up (we hadn’t seen each other in two weeks!). We did a 75 minute Dave Farmer podcast, finally! I have been meaning to check out his podcasts for years. It was really nice, just the right amount of challenge for today. It was also fun to practice at home with a friend! The podcasts are available for free and most (all?) are 60-75 minutes. Each class is vinyasa and is intermediate to advanced. I was surprised by how easy it was to follow along without the visual cues, only once did we get a little confused but it could have just been us (we may have accidentally been day dreaming about lunch ;)). Lunch. By the time yoga was over and lunch was actually made it was close to 3 and I was over-hungry. But it sure was good. 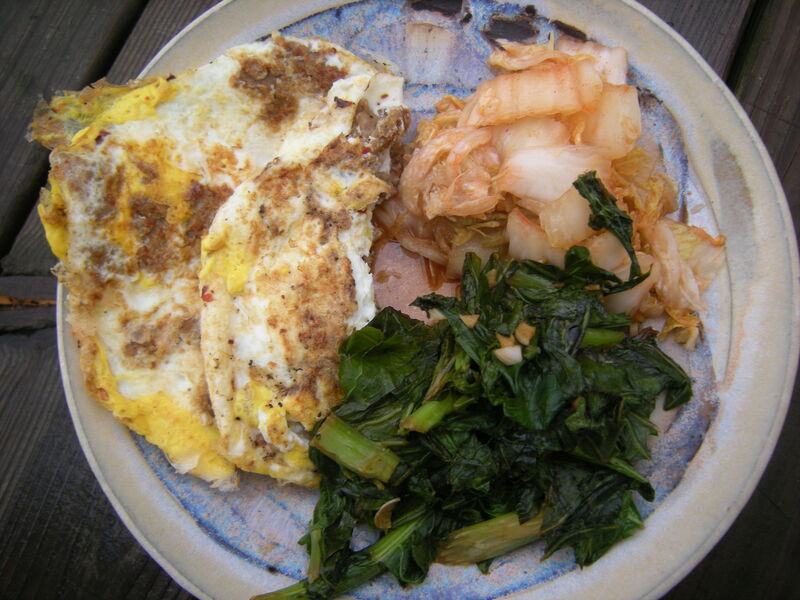 Eggs and soysauge, kimchi, balsamic-garlic turnip greens. Yum. I took a clue from Kath and drizzled a tiny tiny bit of maple syrup on the greens. Yum. I’d never had turnip greens before, they were super…fiberous? As in, hard to chew! I bought them because they are super high in vitamins A and C, two thirds of the ACE immune boosting trio (vitamins A, C, and E). They were good and I think they’d be even better if I cook them longer next time. After lunch I swung around my kettlebell and did some basic strength exercises for about 15 minutes. It was actually fun to just play and not be concerned with reps or sets or time. I knew I needed to get outside before it got dark and was actually really looking forward to a walk but I could not get out the door! Finally I put on my jacket and had an image of two hands on my back, literally shoving me outside! And it worked! I called my dear friend Rachel and talked to her for an hour as I power-walked into dusk. Just as I suspected, it felt great to be outside and it completely eradicated the lingering hunger I had after finishing lunch (a sign that the hunger was more emotional than physical). But now the hunger has returned, and this time it’s for real. So into the kitchen I go, time to whip up some miso soup. Awesome job to all of you out there who got a great workout in on this first Sunday of 2011! Last day of COMMENT COMMIT! Thank you for joining me for 14 days of committing (publicly!) to daily workouts and encouraging each other to stick with exercise through the holidaze. We yoga’d our way into Christmas Eve, sledded down Christmas Day, kept walking during that odd week between the 25th and the 31st, and Exercise TV’d into the New Year!!!! Yeah, we pretty much rocked our way into 2011. Let’s do one more comment commit for good measure. I am still a little under the weather but I think this amount of exercise will be perfect. And YOU? What’s your workout plan today? There’s nothing like a little public obligation to get you moving! P.S If you haven’t participated in Comment Commit yet, it’s super simple. Write a comment with your exercise goals for today and then come back this evening and brag about your accomplishments!